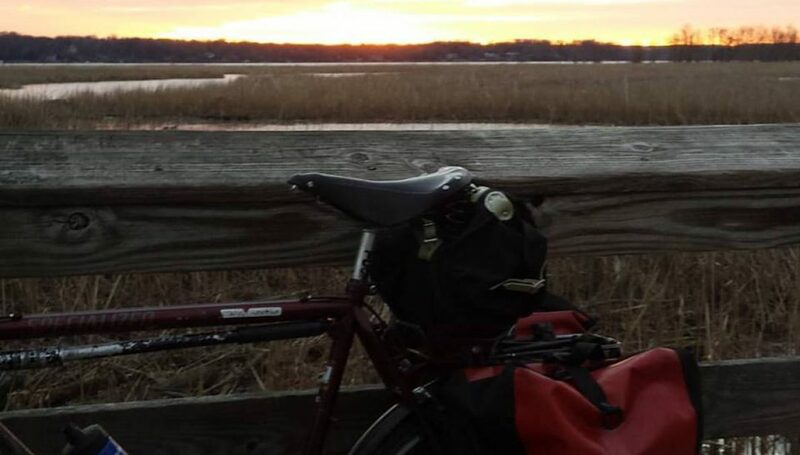 What did you do with your bike at restaurants, stores, nature breaks, etc.? I was mostly in small towns or along the side of a road in the middle of nowhere. I would lean my bike against a wall and not bother to lock it. I figured if a thief tried to steal my 80 pound bike, he’d probably crash within a few yards. Sometimes I’d through my U-lock on the front wheel to immobilize it or keep the front wheel from flopping which might cause the bike to tip over. It was far more likely that a thief would take something from the bike. The rear panniers were buried under the tent and sleeping pad so they were inaccessible. The front panniers didn’t contain much of anything valuable. If you’re that hard up for chamois cream, go ahead and take it, brother. My handlebar bag was another story. That contained, among other things, my wallet and cell phone. I am absolutely paranoid about losing either. (I even took a picture of my driver’s license in case someone stole my wallet.) I checked to make sure they didn’t fall out of the bag several times per day. If you’re smart (smarter than me) you’d carry a credit card, a copy of your id, and cash elsewhere in your gear. Of course, then you can worry about that stuff getting lost or stolen. Where did you put your bike overnight? When camping I’d have all my gear in my tent. This would leave my bike vulnerable to theft. First, I’d try to orient the door of my tent so that it was facing my bike. When things went bump in the night, I could peek outside and check on The Mule. Second, I’d secure my bike to something solid. When there was a picnic table available, I’d use a bungee cord to attach the bike to table so that it wouldn’t get knocked over. One bad fall and you could break a shifter lever or your derailler and that would be bad news. If there was only a tree around, I’d use the bungee to make a loop through the front wheel and around the seat post. This would keep the front wheel from flopping. Finally, I’d throw my lock on, if only to immobilize a wheel. Anything to make the bike undesirable to passersby. Overnight or when it looked like rain, I’d cover my leather saddle with a waterproof seat cover. At hotels, more often than not, I’d roll my bike right up to the reception desk as if to say, “Look, it’s already inside.” I’d ask for a first floor room. Failing that, I’d ask about an elevator. A couple of times I had to carry the bike up the stairs. I’d unload it first, of course. I’ve only once had a hotel tell me I couldn’t take my bike in a room. This was in 2004 when I was touring with Big Nellie, my long wheelbase recumbent. They put it in the luggage storage room. Always ask at hostels if there is secure bike parking. The hostel in Astoria didn’t have anything for me to use so I hauled The Mule up three short flights of stairs. After 4,200 miles, this was not fun. The hostel in Columbus had wall mounted bike racks in the living room, but I had to carry the bike up some steps to get into the house. The hostel in Pittsburgh had a garage. The one in Portland had bike storage in a keyed basement luggage room, accessible by an elevator. I have two prescriptions that I needed to take on a daily basis. For my asthma medicine I had two partially used maintenance inhalers in hand. Then just before leaving town, I refilled my prescription for the last time. This was good for almost two months. My doctor is planning to tweaking in August so she gave me a sample inhaler to bridge me to my next appointment with her. For my eye drops, I brought the prescription box with me. In Lewistown MT, a pharmacist used the information on the box to call my drug store at home and transfer the prescription to him. When I got home, the local pharmacy called Lewistown and they transferred it back. How did you arrange for travel home? One of the best aspects about being retired is I don’t have to get back to work on a certain date. The flexibility takes some stress from the tour. But I still have to get home, and do so without crushing my finances. In Florida, I booked a return trip on Amtrak while staying with a friend in West Palm Beach. It was ten days away so I had plenty of time to make the train. Using The Google, I found a bike shop and arranged to drop off my bike. They boxed the bike and acted as the shipping agent for FedEx. The bike is going to my local bike shop who agreed to be the receiving agent prior to the tour. The particulars of shipment were done through BikeFlights.com which was pretty easy to use.